Hey, sorry for the long layoff since the last post. Since my first course ended, I have not been on nearly as many gorgeous trips that lend themselves so nicely to photos. Instead, I have been attending regular class at UCT and conducting some research. I will not talk about the research at the moment, since I believe the data may be somewhat sensitive (that makes it sound so much more dangerous than it is). Lectures have been going quite well though, particularly my Transportation Planning course. While I would not say that the tutorials in Transportation Planning are necessarily the most riveting, they are certainly very applicable to the everyday world which is refreshing. So the first interesting tutorial is actually part of a larger project that will take place over the course of the semester. In groups of six, we all had to go and stand outside an intersection on Main Rd. I happened to draw Woolsack Drive and Main. We showed up at 7:30 in the morning to begin the data collection, marking down all of the cars, minibus taxis, buses, motorbikes, pedestrians, etc. in five minute increments for an hour. Later on we will actually create a traffic flow model using the data which should actually be interesting (to me). The following tutorial was about waste management. 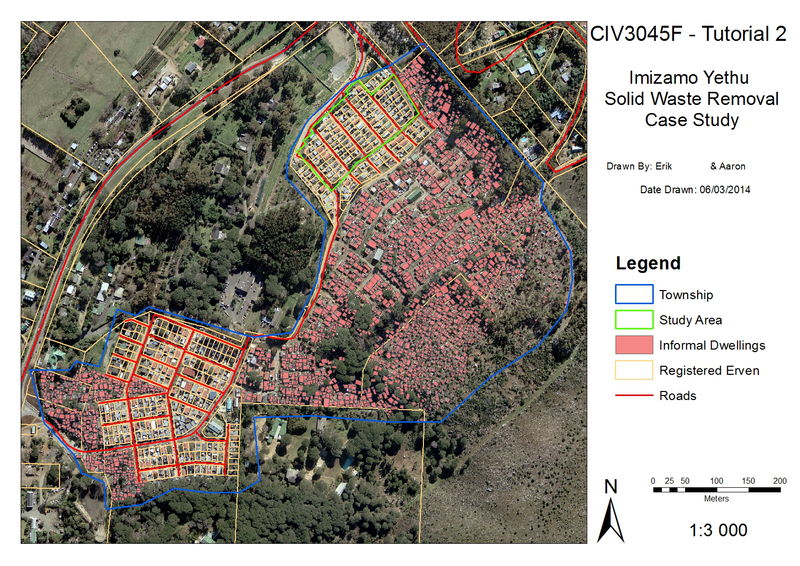 I believe our professor wanted to impress upon us how much an issue this can be in townships in South Africa, given that there are not roads large enough for trucks to reach all of the informal housing. So instead, they gave us a nice Excel sheet where we had to fill out some blanks and we had to use ArcGIS to find some data like the number of formal and informal households in the township. I want to thank my lab partner Aaron as well; he really made everything much prettier, like in the layout map below. I am not quite sure how the law works here in South Africa, but the data at the very least is the property of UCT, and if it is like the United States, then the work I did is as well although I do not think anybody will get too ticked off simply because I put up work I did myself (and with Aaron). There were a few issues with the data, mostly things like households not being marked properly in the data set. A couple examples are below. Clearly the person collecting the data did not see these informal shacks (or more likely they wanted to make sure we would have to notice). The same thing happens with the formal housing as well. Assuming the data is somewhat accurate, we found that the Imizamo Yethu township would produce 91626 kg of waste per week, which would require a full six working days (6.5 hour days according to the instructions) with the standard trash trucks that can pick up 5280 kilograms per load. Obviously this is a huge issue, although informal households actually produce much less waste for a variety of reasons. Presumably wealthier areas would produce even more. Furthermore, the roads surrounding informal households are generally not large enough for trash trucks. Our proposed solution was to give informal households trashcans and hire a few people to bring the trash to roadside collection points. The money can come from the reduction in spending on cleaning up waste on the streets, which the City of Cape Town spends millions of rands (hundreds of thousands of dollars) on. There are still plenty of issues with the idea, like how good trashbags are actually fairly expensive in the first place, and I'm sure any South African will point out other holes quickly enough. Regardless, it was an interesting thought experiment. This is the kind of work that can really help people when done properly, even if we were working with a "nice" dataset in this case. You have to start somewhere after all. Access to Banking Services in Washington D.C.